Verses 1-14: The healing of a man who had been an invalid for 38 years. What a surprising question Jesus asks, “Do you want to get well?”. A really important question because sometimes we like to stay just where we are rather than face the challenges that becoming well will bring! Perhaps Jesus was asking the man, “Do you want to remain as you have been for the last 38 years!” Even in our “unwellness” there can be a “comfort” that we don’t wish to be disturbed! Verses 16-28: In these verses Jesus makes it clear beyond all doubt that He is “equal with God” (v18) and this incensed the religious leaders of the day. Their refusal to believe who Jesus was, was their downfall. What an amazing “cross over” believing Jesus brings – “I tell you the truth, whoever hears my word and believes him who sent me has eternal life and will not be condemned; he has crossed over from death to life”. The word “dead”, of course, refers to being spiritually dead. The most important event in the life of any person on the planet is to “hear and live”. This is what Jesus was referring to in chapter 3 when he talked about being “born again” or “born from above”. So transformational is this event in the life of a person that Jesus uses the illustration of it being equivalent to being born again. How vital that we “hear” what Jesus has to say! The old saying “There’s none so deaf as those who will not hear” was the problem with the religious leaders of the day! Although there are many thoughts, actions and words that come in the category of being sinful, the single most critical, catastrophic of all is to not believe in Jesus! 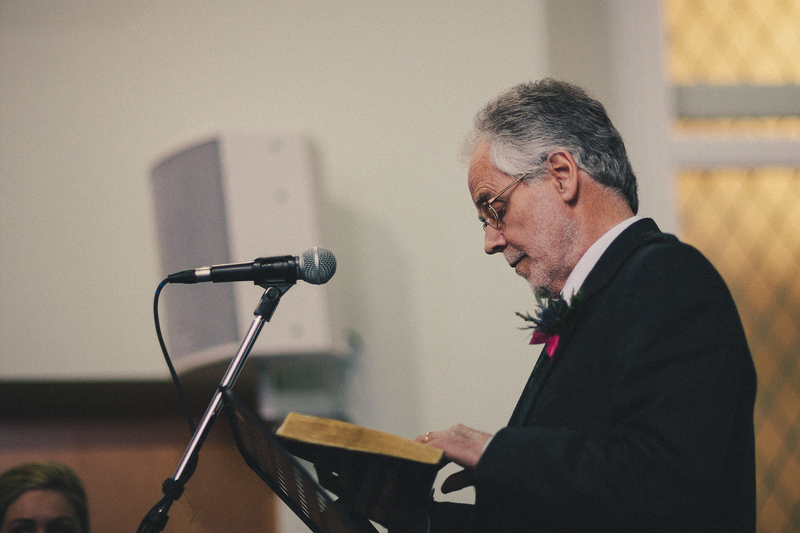 This is a photo of my Dad speaking at our wedding a couple of years ago – He’s read through the gospel of John more times that I’ve been to Nandos or watched Match of the Day! What a blessing to have a Dad who still reads John in his 72nd year!